Have you ever wondered how you can make your exercise routines better? Or perhaps you want to improve your lifestyle but are not sure about how to maintain a proper workout routine? Exercising is important, but it is just as important to monitor the exercise and see where you need to improve. You can do that by having the best pedometer watch on your wrist while exercising. A pedometer is something which can help you achieve your workout and exercise goals. You can measure the amount of steps you take each day, as well as the calories you burn. In this way you will see how much exercise you are getting and you can also set goals for each day. A pedometer watch is reliable and easy to use, and there are some really stylish ones in the market which can complement your entire look! If you are wondering how to get one, then wonder no more, because we are here to help with that! Today we are going to talk about the best pedometer watches in the market, with regards to features, price and quality. After this review you will be equipped with firsthand knowledge about such watches and you can then go buy one for yourself. We will also talk about the features which you should look for before purchasing such a watch. There are a lot of things you need to consider before you buy a pedometer watch. We will talk about these points so you can choose your specific pedometer with care and caution. Before you set out to buy a watch, you need to think about the features you require. Do you only want a basic pedometer which measures the number of steps and calories measured, or would you like more detailed information? While the basic function of pedometers is to calculate steps, many models offer other information as well. For example, you can choose one which measures your distance as well as speed. Still other models monitor your upward descent with the help of an altimeter, which can come in handy if you are climbing. Many come with stopwatches and alarms as well. Some pedometers offer sleep monitoring, which monitor when you sleep and differentiate between light and deep sleep. Design is a matter of personal preference. While a lot of pedometers are slim affairs, these days wide, clunky pedometers are also available. 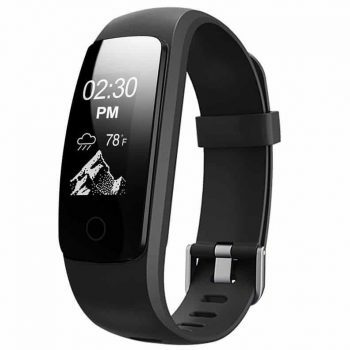 Mostly smart watches which contain pedometers are large and have a big face to display greater data. You can choose from among a large assortment of colors. Always pay attention to the display face, as this is the surface you will be interacting with. The display should be large and clear enough that you can see all the data but should not be so big that it looks ridiculous on your wrist. Some pedometers only display one variable at one time while others let you see all the variables at once. The band should be comfortable because pedometers are mostly worn for a long period of time. Always try it on before you buy the product, to check for comfort as well as size. The material used for the band is very important. If the band irritates or chafes you even a little bit, it is better to go for another pedometer watch. Waterproofness plays major role in making the right choice. You are best off with a waterproof pedometer watch as you do not have to take it off in the rain or in the shower. Different watches have different waterproof rating. While water resistant ones will still work if you wear them in the rain, you need a specific fully waterproof watch if you want to wear it while swimming. You need to consider whether you need a simple pedometer or a smart watch. A smart watch can offer many benefits, such as ability to share the data, downloading exercise apps, data analysis etc. If the watch is synced with your phone, you can even receive you calls, texts and notifications on the watch. Before purchasing, always check the OS compatibly of the watch. 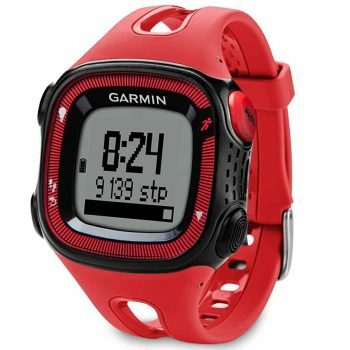 We are going to list the best pedometer watches in the market. All of them have been selected for their ease of use, reliability as well as value for money. The Letsfit Activity Tracker Watch lets you monitor not only your steps but your heart rate as well. If you wear it while sleeping, the watch monitors your sleep and its different stages. This pedometer is best used for tracking your running and jogging sessions. It is waterproof so you can wear it during the rain. The design is pretty sleek and stylish and the watch will look good on your wrist. It has an adequately sized, clear display which lets you see your activity. Every time you turn your wrist towards your face, the display lights up so you can see your number of steps. The watch comes with default sports modes including treadmill, running, riding etc. You can add more modes as well. The heart rate is measured continuously. You can also connect the watch to your phone and transmit all the data. Related: Coffeaa Fitness Tracker is another pedometer which lets you measure heart rate as well. This smart watch has a long battery life and one time full charge will last about 7-20 hours in the tracking mode. The Garmin Forerunner 15 lets you calculate a lot of variables, which is why it is perfect as a sports watch. You can even measure the distance you have traveled while cycling jogging etc. While using the watch in training mode, you can expect the battery to last up to 8 hours with the GPS enabled. However, when you are simply using it as a watch it will be able to work for up to a week. This device not only lets you record your activity, it also motivates you to perform better. You can set goals for yourself and see how well you are measuring up. There is an inactivity indicator as well which warns you if you have been sedentary for far too long. You can also see your average pace so you can evaluate how much you need to improve. With a high waterproof rating and a comfortable band, this is definitely a watch you can wear all day long with no problem. Related: If you want a watch with clear display which can be read even in the sunlight, go for Garmin Vivoactive Hr Smart Watch. This one measures heart rate without an additional heart rate monitor. 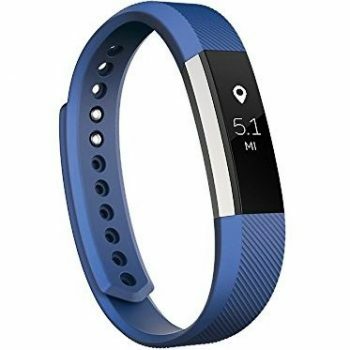 The Fitbit Alta Fitness Tracker is definitely among the more famous pedometers. 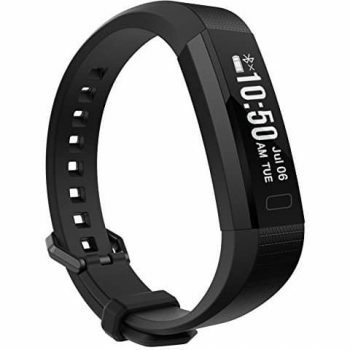 Fitbit is a well-known name in this industry, and this model does not disappoint. Perhaps the best thing about this watch is that is very reliable; you can rest assured that the variable which are being shown are pretty accurate. The OLED screen displays the data in the form of clear numbers which you can read easily, even in the sunlight. Notifications and call alerts are displayed as well. While the device in itself is pretty stylish, you can choose to change the wristband if you want and instead go for a leather or metallic one. The watch comes in three sizes so you are sure to find one which fits your wrist perfectly. One glaring negative point is that the device does not measure your heart rate. This is a relatively pricey product and heart rate monitoring should have been an option. Other than that, this is definitely one of the best models in the market. Related: If you want a product that measures your heart rate as well, go for Fitbit Charge 2. You can choose heart rate zones as well including cardio, peak and fat burn. The Willful Non-Bluetooth Pedometer is a simple pedometer that does its job without the need for a smart phone. You can simply measure all the variables and see them on the display screen. However, if you were looking for a smart watch which lets you make and receive calls etc. this one is not for you. Not being synced to a phone can actually serve as an advantage as this pedometer does the exact job it was designed for – monitoring your exercise levels so you can improve yourself without the distraction of call, text and message notifications. You can enter your age, weight and height in this device to get more accurate data. The display screen is large enough to let you view all your data with ease. You can wear the watch all day long; however you should know that it is not waterproof and hence you must remember to remove it before you take a shower or head out in the rain. All in all, this pedometer offers great value for money and is ideal for people looking for a simple device. Related: If you want a device that connects to a smartphone, look at Willful Fitness Tracker with HR Monitoring. This one can be synced with both iPhone and Android and hence les you view your data on the phone. The EVIOTOR Activity Tracker can be synced with your smartphone and hence you can transfer all your data to your phone. You can also download a fitness app and use it to analyze your data and see where you need to improve. The display is sleek, and the touch screen lets you view different variables by swiping. You can monitor your sleep as well by syncing your watch to your phone and downloading CUBOT V2 app. This lets you record you light and deep sleep as well as the number of hours you spent sleeping. You can set alarms on the watch, and the vibrating feature ensures that you will not miss an alarm if you are wearing the watch. The waterproof watch can be worn in the rain and is resistant against splashing, thus letting you record your activity in all sorts of weather conditions. Best use: Tracking and improving your workout and running sessions. 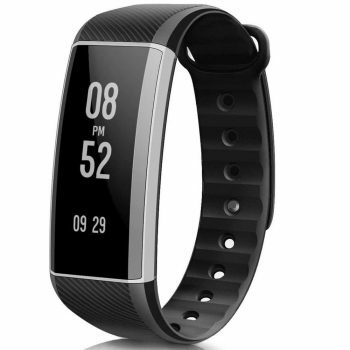 The LEMFO Fitness Tracker Smart Watch is an affordable watch which has all the features which any normal smart watch has. It can be synced to your phone and thus you can receive all your calls, texts and notifications on it. As an exercise watch, this one measures your steps, calories burned and even your heart rate. If you wear the watch to bed you can see how well you slept. The watch is water resistant, which means that it will work fine in case of rain or if there are water splashes but will not work if you wear it while you swim. You even get alerts if you have been sitting idle for far too long, so you can be motivated to get up and get some exercise. The watch comes with two interchangeable bands, so you can choose one according to your own taste and even according to the clothes you are wearing. 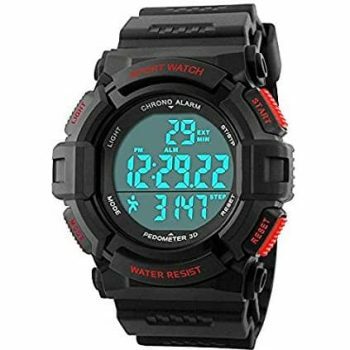 For the price, this pedometer watch is definitely a very good option. Related: If you want a watch with a bigger, square display, you should consider buying LEMFO Smart Watch for Android and iPhone. This one can measure your activity as well as sleep. The Gosasa Sports Fitness Watch is for those people who want to keep thing simple and only record the number of steps they take each day. As a watch, this one is right about perfect with a stopwatch, alarm as well as a calendar. The watch is water resistant up to 50 meters, which means that you can easily wear it in the rain and even in the shower. You can take it with you while swimming as well. The comfortable band will rest easily on your wrist and will not chafe or irritate the skin. The watch is pretty durable, with a strong, sturdy back side and durable glass on the display. Perhaps the best feature is that you do not need to recharge this watch all the time as the battery lasts for a couple of years. The watch is a basic one, and while it will count your steps, it does not calculate stair steps, calories or when you are climbing. Therefore it is not an ideal choice for those people who need to calculate all the details of their exercise pattern and calories burned. Related: Another simple pedometer watch that does not connect to a smartphone is the Feifuns Pedometer Bracelet. 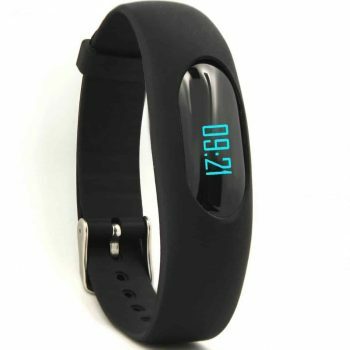 It has a sleek design and also calculates your calories, distance and activity duration. It can be charged without a cable. Best use: To track your pace and calories during any exercise. The Garmin Forerunner 230 GPS Watch is a high-end sports watch, which is pretty accurate and reliable. It gives you a vibration alert when you have been idle for too long, and motivates you to move and get some exercise. The screen is large, round and can be easily read at all times, even in the sun. If you want to calculate your heart rate while you exercise, you will have to buy a separate heart rate monitor. You can connect the watch to your phone and hence receive all notifications on the watch. All your tracking data can be transferred to your phone from where you can analyze it and see what you need to do to improve yourself. 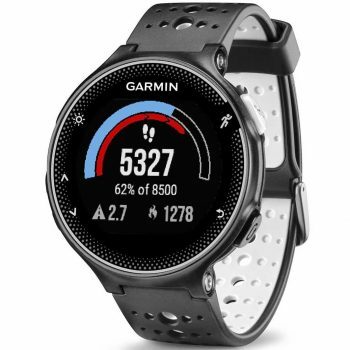 Garmin is a well-known name in the fitness industry because of their high-quality products, and this pedometer w=smart watch does not disappoint. It is well-made and sturdy, and will not break down easily. Related: if you are looking for another Garmin watch but in lesser price, check out Garmin Forerunner 10 Watch. It calculates steps, calories, speed and distance. This is where our review ends. Now you know all about pedometer watches and how to choose the right one for you. In our list, we included both simple pedometers and others that act as smart watches. It is up to you to decide which one will best serve your purpose. Pedometers watches are quite useful when it comes to tracking your exercise and setting up goals for yourself. Did you like the pedometers we talked about, or is there another one you know about which we missed in our review? Do let us know in the comments section.